Turn of 19th/20th century pair of gilt spelter figures of harvesters. Turn of 19th/20th century lovely pair of gilt spelter well modelled male and female figures of harvesters. The female figure carries a large wheat sheaf, while the male carries produce in his apron. Size-9.25 inches high by 3.5 inch diameter base. A very decorative pair for table, sideboard and mantel. Great to have a pair. 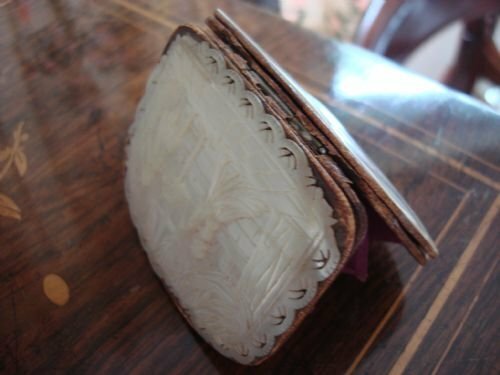 Lovely 19th century hand carved mother of pearl and leather coin purse. 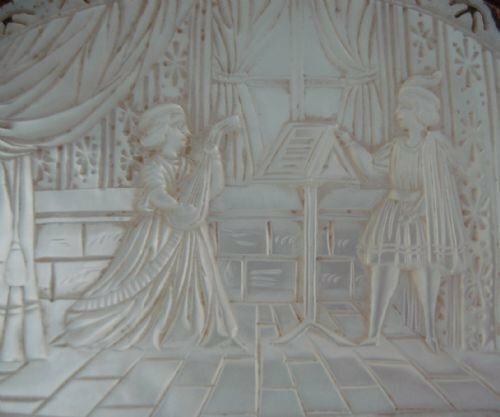 Very striking 19th century hand carved lustrous mother of pearl and leather expanding purse with intricately carved Renaissance scene on front plaque of a female musician playing the mandolin to accompany a male singer, while both of them read music from a duet music stand. They stand on what appears to be an elaborately decorated stage with thick curtains pulled back with tassels. 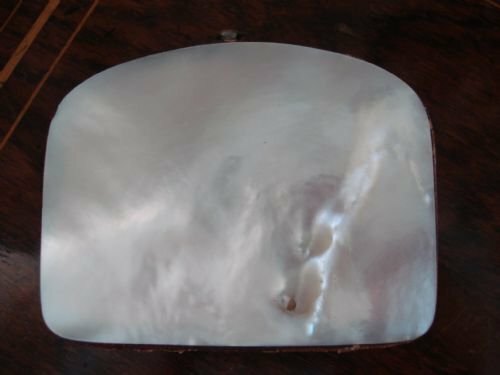 The reverse of the purse is a plain mother of pearl plaque. 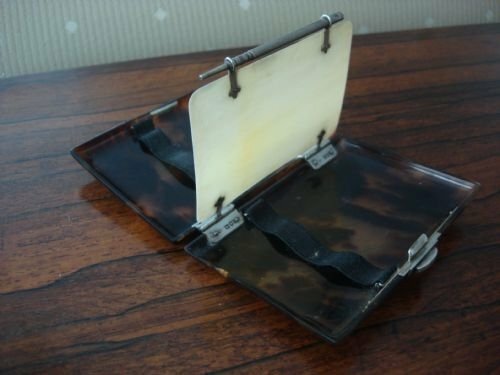 Under the mother of pearl is a leather covered metal frame. 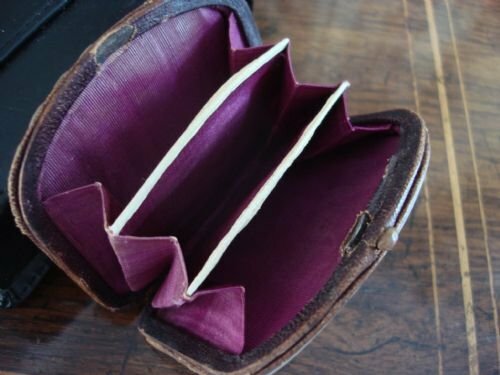 The purse opens to reveal crimson silk lined compartments. It is hinged on bottom, and closes with a tightly sprung push button catch. Size-3 inches wide by 2 5/8 inches high by .5 inches deep closed. A beautiful little purse in very good condition for its age, with the exception of some losses to the pierced scalloped border around the front plaque as seen in photos. 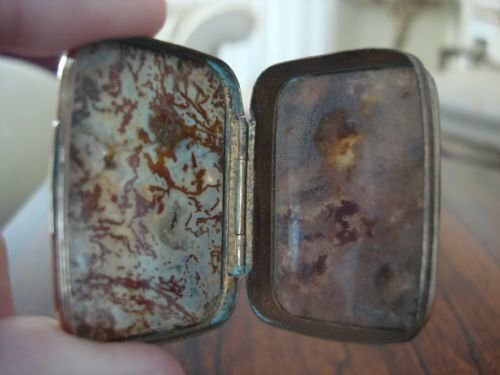 A lovely object for a collection with beautiful colour and patina. Due to the musical theme, it might also be nice as a gift to someone who is musically inclined. 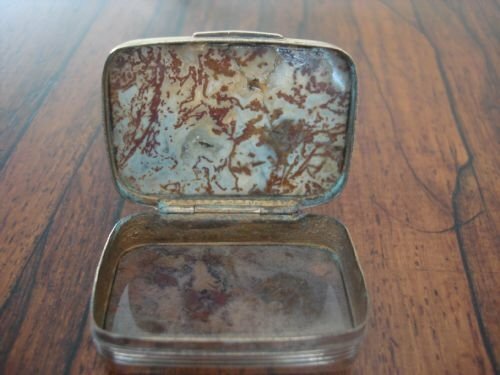 19th century moss agate and gilt metal snuff or pill box or trinket box. 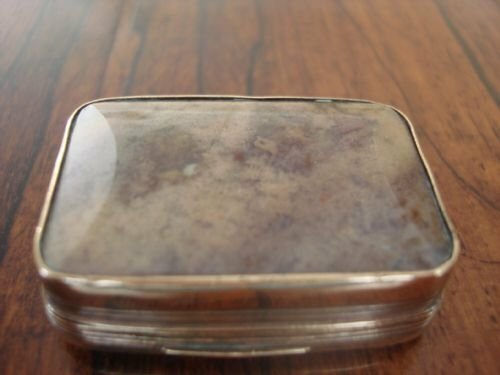 19th century very attractive oblong moss agate snuff or pill box with gilt metal frame with thread detail. The agate to top and bottom is beautifully coloured and veined with chamfered side edges. At some point in the past, the top was cracked and expertly professionally restored, which is difficult to notice. It is strong and secure, and blends well with the veins. Size-1 7/8 inches long by 1 3/8 inches wide by 5/8 inches high. 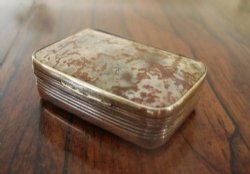 A lovely box for the snuff collector, or to use for pills, trinkets or desk tidy in good condition overall. George III period, circa 1790, stunning ivory and gold toothpick or patch box. 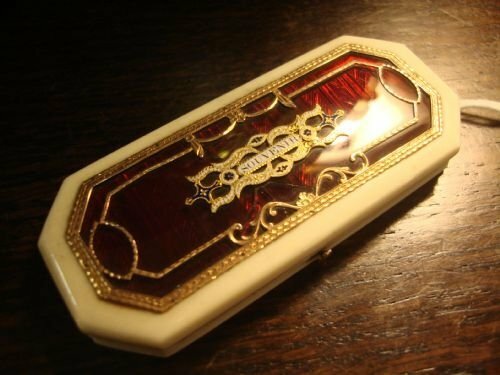 Circa 1790 extremely unusual and stunning octagonal shaped gold, ivory, glass and enamel patch or toothpick box most likely acquired during the Grand Tour by a young gentleman of means. "Souvenir" is French for memory, so it is possible it was acquired on the tour in France, or given as a gift from a sweetheart hoping to be remembered during his travels. In any event, it is a lovely object mainly made of unblemished ivory having a wonderful patina, and trimmed with a design of gold roping, scrolls and garlands. The "souvenir" plaque to centre is gold, white and blue enamel, the whole overlying a red glass inset panel. It is extremely striking. 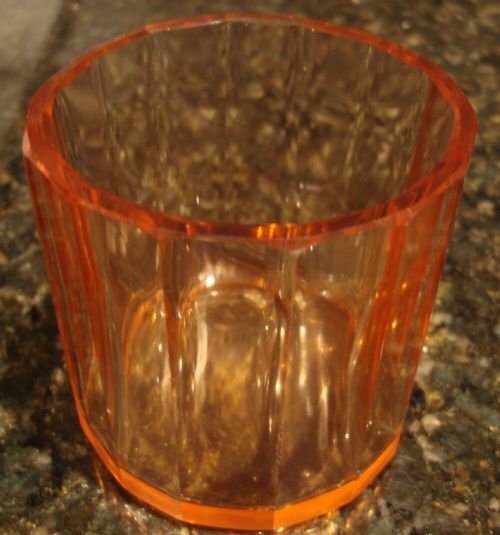 The only flaw is one "v" shaped crack on top lid in left lower centre of glass. It is neither raised nor separated, and could be restored if desired. It is not detracting. 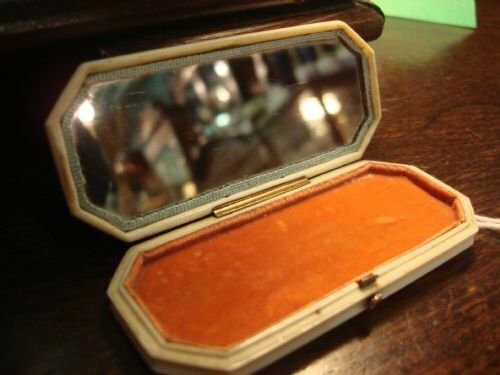 In the interior, the original mirror lines the inside of the lid, while the interior base is velvet lined. Of generous size-3.75 inches long by 1.6 inches wide, by 1/2 inch deep. Overall, it is a very rare object in very good condition. 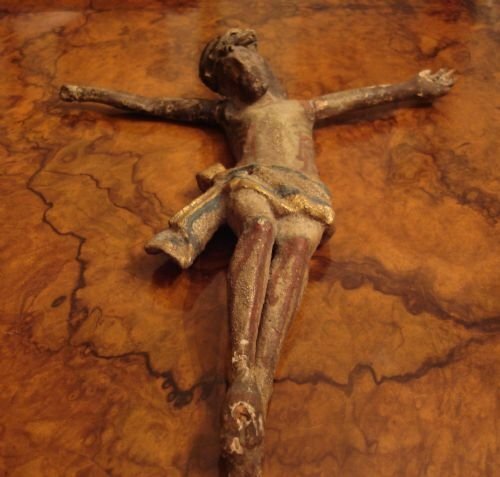 Circa 1850 exquisite French solid rosewood and mother of pearl inlaid and gilt metal crucifix. Circa 1850 French solid rosewood crucifix with profusely inlaid mother of pearl, and with gilt metal body. Beautiful design of crown and stars to the top three shaped ends, with a vase and grasses to the bottom shaped end, and outlined around the exterior. 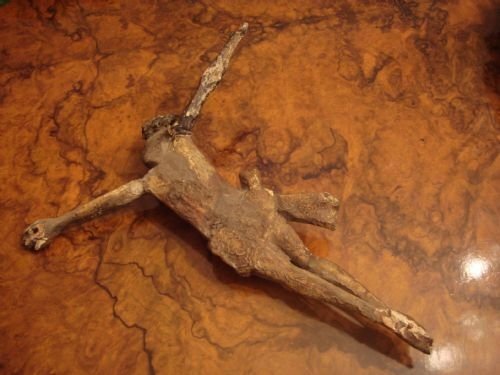 The body is beautifully moulded, has a lovely patina, and still retains much of its original gilding. 14.75 inches long by 8 inches wide. Both an antique religious symbol and a beautifully crafted object, to be appreciated for either a religious or collectable purpose. 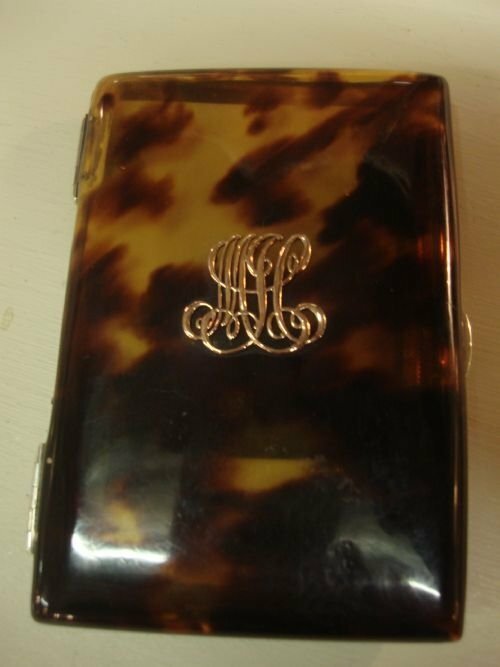 London 1905 striking tortoise shell and ivory, hallmarked solid silver and gold aide memoire case by very good and collectable maker HARRY ATKIN. 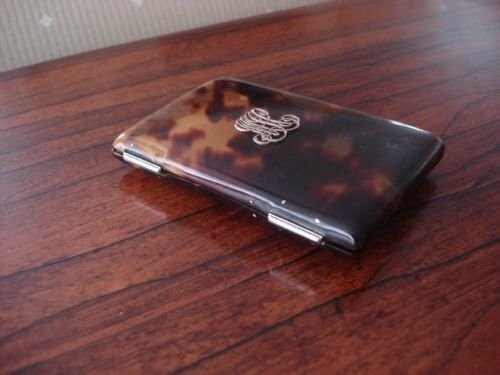 London 1905 stunning English hallmarked solid silver, gold, tortoiseshell and ivory, wonderful aide memoire or pocket necessaire card case, by very well known and collectable maker, Harry Atkin. 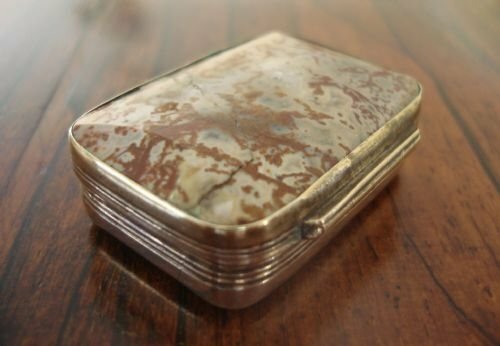 This very beautiful and unusual case has solid silver fittings and pencil, and the original interior bands that would have held cigarettes, small cigars, visiting cards, papers and/or money. The centre portion is an ivory panel and attached engraved propelling pencil that was for note making. This hinges flat in either direction to access the contents below. The case itself opens from the side and folds open completely flat for access. 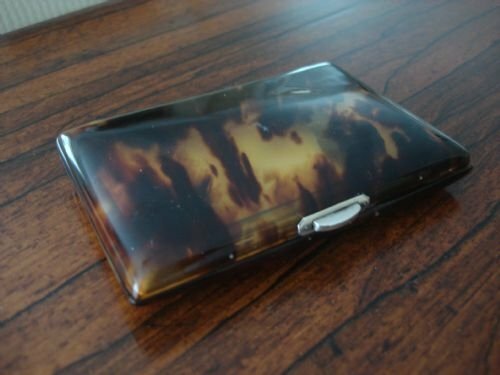 The tortoiseshell itself is very beautiful in its tone and colour, and has a lovely patina. Very attractive unmarked gold scrolling initials of the original owner are applied to the front cover. 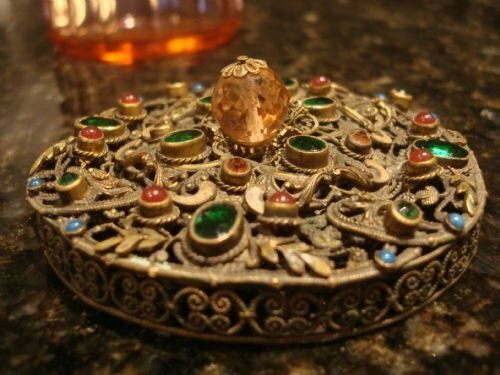 Only a very well to do person would have owned such an extraordinary item. Size-4 1/8 inches long by 3 inches wide by 5/8 inches deep. With an old professional repair to crack in corner (no loss, and very difficult to spot), and small bruise to top of pencil. 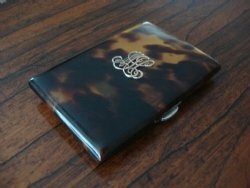 This is a wonderful unusual and lovely object for the collector of cases, for display or to use for business cards, cigarettes or cigars. Please also see a number of other card cases newly listed. 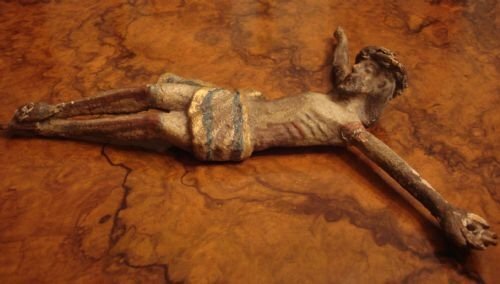 Circa 1800 carved wood Corpus Christi with original paint. 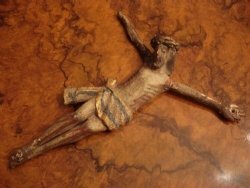 Very unusual circa 1800 well carved wood Corpus Christi with traces of the original paint, possibly once mounted on a large crucifix. With lovely detail, showing ribs, blood, crown of thorns, part of stake remaining through feet, and gilt and painted sarong. With loss to part of right hand, and slightly loose joint to right shoulder, this is in very good condition overall for its age. Size-10 inches wide by 11 inches long by 2.25 inches deep. 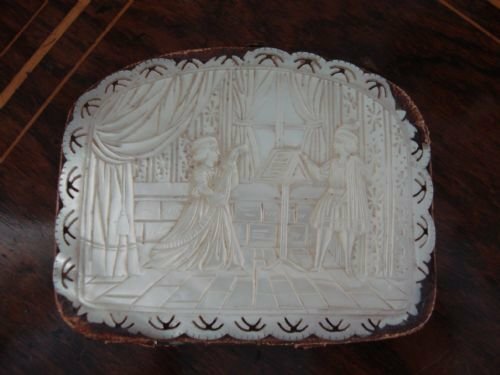 A lovely and unusual carving. 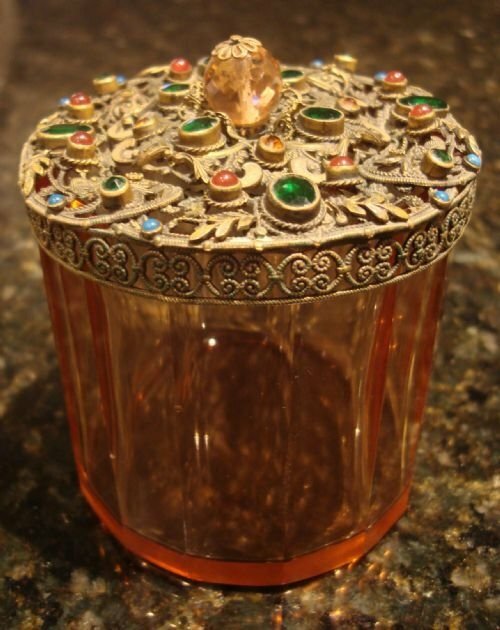 Circa 1900 unique faceted cut glass cranberry glass jar with bejewelled gilt metal top. 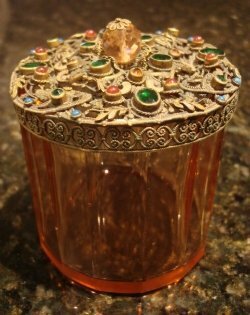 Circa 1900 wonderful cut glass panelled cranberry glass jar with jewelled gilt metal filigreed top, likely of Continental origins (probably French). 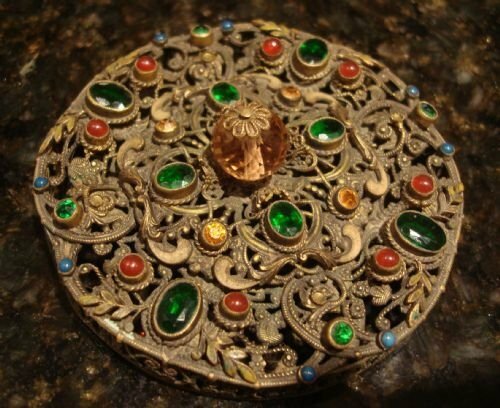 The 14 sided facet cut jar is beautifully cut, while the top is gilt and pierced and inset with many lovely coloured paste stones in varying sizes. Size-3.25 inches diameter by 4 inches high. It is an excellent container for dressing table or desk, and would make an great jar to use for a tidy, jewels, or whatever one likes. 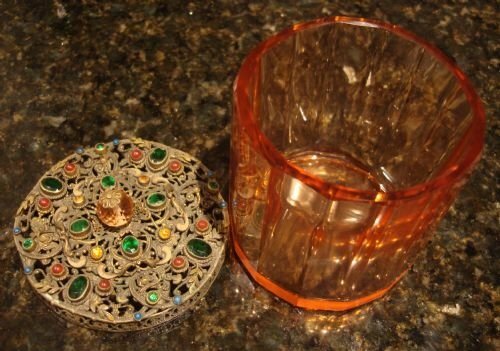 A very unusual piece, most functional and decorative, which would make an excellent gift. 19th century beautifully carved ivory Chinese figure of a man. 19th century beautifully carved ivory Chinese bearded figure of a man, having excellent colour and the lovely patina that only comes with age. He is Lu Tung-pin also known as Lu Dong-Bin, the leader of the 8 immortals of Taoist Chinese legend. The costume is nicely draped, and he holds a magic sword in his hand. There are the usual age hairlines present. Size-6.75 inches high by 1 5/8 inches diameter. Great colour, well carved, and in very good condition. Please see complementary figure of a Chinese woman, Ho Hsien-Ku, also known as He XianGu, listed separately. She was rescued from a demon by Lu Tung-pin by using his magic sword. He then brought her into the group of immortals. 19th century beautifully carved ivory Chinese figure of a woman. 19th century beautifully carved ivory Chinese figure of a woman, having excellent colour and the lovely patina that only comes with age. She is Ho Hsien-Ku, also known as He Xian-Gu one of only two women among the eight immortals of Taoist Chinese mythology, and wears a lotus blossom on her head. She was brought into the group of immortals when rescued from a demon by Lu Tung-pin using his magic sword. The costume is nicely robed, and there is great detail to the figure including the flowers and leaves. Size-8 inches high by 1 5/8 inches diameter. Please see complementary figure of the Chinese man, Lu Tung-pin also known as Lu DongBin, referred to above, and listed separately.